HUSSONET (USA) (Chestnut 1991-Stud 1994). 2 wins at 2, 3d Aqueduct Count Fleet S., L. Champion Aust. Sire (AEI) 2007-08. Sire of 994 rnrs, 770 wnrs, 96 SW, inc. Weekend Hussler (MRC Caulfield Guineas, Gr.1), Wild Spirit, Printemps, Trotamondo, Husson, Penamacor, Host, Desert Fight, National Park, Lhiz, El Cumbres, Mar de Kara, Franbulo, Pecoiquen, Mail Coach, La Chiflota, Domaine, Hush Money, River Cafe, Marzuk, Contentment, Glorious Days, etc. WICKED SECRETS, by Keep the Faith. 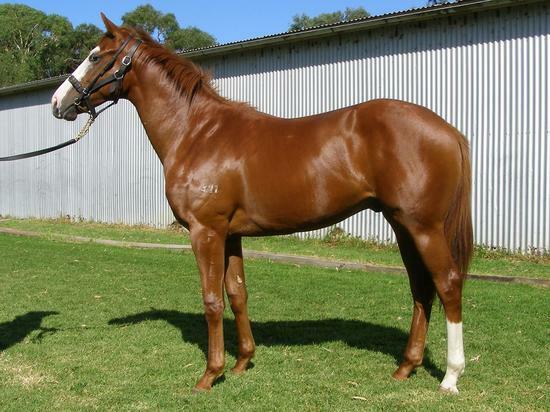 3 wins to 1100m, SAJC Sportingbet P. Half-sister to GOOD BABY. This is her first foal. GOOD BABY (Hussonet). 15 wins from 1100m to 1700m, 2,682,223Rgt., to 2016 in Malaysia, Selangor Gold Cup, L, Penang Sprint Trophy, L-twice, Penang TC Malaysian Magic Millions Classic, L, Perak TC Sultan Gold Vase, L, Malayan Racing Association Cup, L, Coronation Cup, L, Selangor TC Sports Toto Supreme Challenge Trophy, L, Perak TC Class 1&2 H., 2d Perak Gold Vase, L, Penang TC Anniversary Cup, L, Perak TC Mitavite Cup, Selangor TC Kenilworth Cup, Dewar's 12 Double Aged Sprint H., 3d Penang Sprint Trophy, L-twice, Perak TC Coronation Cup, L-twice. Perplexity. 9 wins from 1400m to 2500m, A$410,870, to 2015-16, BRC Tox Free H., Marriott Hotel H., Qld Tatt's RC Sky Racing H., GCTC Trevor Bailey Racing Stables H., ATC Become an ATC Sponsor H., Edgar Britt 100th Birthday H., McGrath Estate Agents Tracey Dixon H., BRC Acquired Awareness H., 2d ATC Shop With the TAB App H., Myer Spring Fashion H., BRC Brisbane Marriott Hotel P., 3d BRC EDB Training Services H., ATC Hyland Race Colours H., 4th GCTC Chairman's H., Gr.3. Wicked Secrets. 3 wins. See above. Dublin Hug. 2 wins at 1000m, 1200m in Aust. Secret Image. Winner at 1000m in 2016-17 in Aust. Grand Prize. Winner at 1200m in Malaysia. VOODOO BEAT (Sir Tristram). 7 wins from 1200m to 2400m, A$147,855, SAJC Port Adelaide Cup, Gr.3, Dairy Vale 500ml Stubby Quality S., C&G Group H., Alberto V05 H., 2d SAJC Japan Trophy H., L, Derby Trial S., Moe Cup, 3d VRC Duke of Norfolk S., L, Roy Higgins Quality H., SAJC Old Cheddar Cheese H.
SAVANNA AMOUR (Love Conquers All). 3 wins-1 at 2-to 1400m, A$244,500, to 2016-17, MRC Angus Armanasco S., Gr.2, BRC Zouki Group 3YO H., 3d MRC Kevin Hayes S., Gr.3. Secret Haze. 5 wins. See above. Royal Theatre. Winner at 1550m, AJC Bundy Rum Paul McLean H., 3d AJC Sefton H. Producer. Monroeville. Winner at 2, VATC Jim Stynes Melbourne FC H., 3d SAJC Bargambler 2YO H. Producer. Resolution (Pentire). Winner at 2000m, NZ$193,050, A$39,000, 2d Wellington Cup, Gr.1, Matamata RC Stanley Group S., L, BOP RC Domett Trailers H., 3d Auckland Cup, Gr.1, Avondale Gold Cup, Gr.1, AJC Chairman's H., Gr.2, 4th Queensland Derby, Gr.1, ARC Great Northern Guineas, Gr.2. MARAUDING (Sir Tristram). Joint Head of The 1986-87 Australasian 2YO Classification. 3 wins at 2, A$726,300, STC Golden Slipper S., Gr.1, Todman Slipper Trial S., Gr.2, Newcastle JC Penfolds Classic S., Gr.3, 2d STC Silver Slipper S., Gr.2, 3d AJC Sires' Produce S., Gr.1. Successful sire. SPRINGSTEEN (Danehill). 2 wins at 2, A$85,510, SAJC Oaklands P., L, Alcohol Go-Easy S., L, 2d SAJC Dandy Andy 2YO P. Sire. LATIN NEWS (Hussonet). 3 wins-1 at 2-to 1250m, A$464,600, Gosford Guineas, L, 3d BRC BTC Cup, Gr.1. Lake Alexandrina (Bluebird). Placed at 2, 2d SAJC Walter Brown S.H., L. Producer. TRIPLE ASSET (Nadeem). 4 wins at 2, A$267,385, VRC Thoroughbred Breeders S., Gr.3, SAJC Jansz S., Gr.3, 2d TTC Elwick S., L, Gold Sovereign S., L.